Light Up your Dark Areas with Solar Flood lights. Powerbee offer a full range of Solar Powered Floodlights to suit Your every need. Offering great light output all year round. 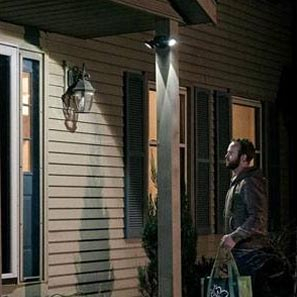 From motion activated PIR lights to remote control & all night led floodlight functions. All designed to operate in the UK. The Solar Panels charge the batteries during the day. Then use this energy from dusk to dawn, to operate the led bulbs. Using a quality solar panel combined with SMD Led's. A motion sensor security light is surprisingly bright. Very easy to install & there are no operating costs. Perfect for spreading light across a large area. Firstly analyse what you need this light for? If it is security then you may wish to consider a pir motion sensor solar flood light. Please see our solar security light section. These types of lights remain dormant until activated. They preserve energy more efficiently as they are only used when needed. This allows them to operate 365 days a year. A motion sensor security light can also add an element of surprise for an intruder. If you need to highlight an area for longer periods of time, then ensure the light has dusk to dawn operation. For highlighting dark garden areas solar powered spots are great. Dusk to dawn setting means the lights will turn on automatically at dusk. It will continue to operate for as long as there is enough charge in the batteries. If you need a powerful flood light for a large area, for 1 or 2 hours. For example stable yard or work lighting. Then a solar powered led floodlight with remote control is ideal. You can switch the lights on & off when you need them. Install an Led FloodLight in Minutes. Simply Fix the led lamp to a wall or Fence post. Ensure the solar panel is located in good bright location - preferably south. Then simply switch the led floodlight on. No electrician is needed. So easy to install you can have effective an powered led floodlight in minutes. In winter months solar powered lights can be challenged. Our range includes remote control operation, multi level brightness settings & timer functions. So whether your are lighting up your home or business sign post, the lighting time can be optimised. Powerbee use high grade polycrystaline solar cells with efficient conversion rates. Large battery capacities, and super efficient SMD Leds. Designed to extend the run time all year in the UK including winter time. PIR Solar floodlights activate the light only when movement is detected. They give you peace of mind, keeping your home or business safe and secure. These floodlights are very dependable when you want them to be on. They conserve far more energy by only using energy when they are activated. Solar powered floodlights require no mains energy. The solar panel generates the power that the light needs to operate. Eco friendly, Ideal as path lights & for security. Cut your energy costs and save you money. Powerbee are Led FloodLight Specialists. We have over 10 years experience in this field, our motion sensor security light range has been tried & tested in the UK. we only stock great quality products that work with our special UK weather!